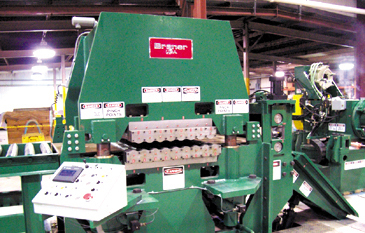 Dover, OH - Greer Steel, a distributor and processor of close-tolerance carbon steel strip has installed a Braner/Loopco Precision Servo-Feed Cut-to-Length Line in its Dover, OH flagship facility. The new Cut-to-Length Line converts 15-ton x 30" wide surface-critical 120,000-140,000 PSI tensile strength coil in gauges from .025" through .220" into precise length panel flat blanks. Equipped with a massive 17-roll backed-up Straightener, a Precision AC Servo-Feed, and a Hi-Speed Hydraulic Shear, the new CTL Line generates precise sheets and blanks at production rates to 40+ PPM. 15-Ton x 30" x .220" x 140,000 PSI CTL Line. Entry Section: Master coils are transported and loaded onto the CTL Line via Floor Level Coil Car. The Coil Car is equipped with narrow coil support stanchions to handle coils as narrow as 2" wide. An Uncoiler that handles 15-ton x 72" OD coils with 16" and 20" ID coils unwinds the coil into the Straightener. A Paper Rewinder rewinds interleaved paper from the master coil. A Telescoping Blade Peeler and Non-Marking Pinch Rolls quickly threads hi-strength coil into the Straightener. Processing a hi-strength paper interleaved coil. 17-Roll Backed-Up Straightener: A massive backed-up Straightener converts hi-strength coil into flat strip. The Straightener is capable of processing a gauge range from .025" through .220" thick. Mechanical property specifications are 140,000 PSI tensile from .025" through .188", and 120,000 PSI from .189" to .220" thick. Strip widths can range from 30" maximum down to 6", narrower with special handling. The Straightener is equipped with seventeen 3.500" diameter chrome plated work rolls with three-back-up flights. All 17-work rolls are driven from a DC motor and multiple output shaft gear reducer though universal drive shafts. The Straightener crown is adjustable via motorized jack screws. Independent entry and exit crown motors allow precise front-rear work roll tilt. 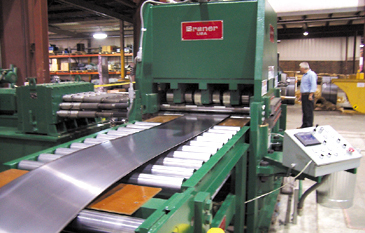 17-Roll Backed-Up Straightener produces panel flat hi-strength strip. Automatic Straightener Control: A PLC controller is employed to quickly set-up the Straightener for various gauge and mechanical properties. Entry and exit roll gaps are computed based upon gauge and yield strength, and the work roll gaps are automatically accomplished. The operator can override the automatic control to make roll gap adjustments while running the coil. 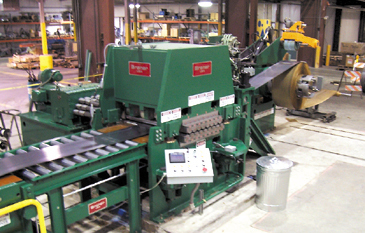 A low-inertia roller table is installed between the exit end of the Straightener and the looping pit to allow the operator to constantly inspect the strip flatness and surface condition. Panel flat hi-strength strip emerging from the Backed-Up Straightener. 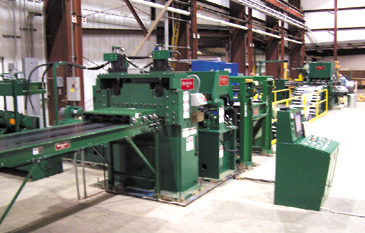 Automatic Roll Gap Controls speed the set-up process. Free Loop Operation: The Straightener flattens and drives the strip into a free-loop ahead of the Servo Feed. A heavy hydraulic Table bridges the looping pit and carries the strip from the Straightener to the Servo Feed. The strip is supported on hi-capacity low-inertia rolls mounted in large radius multi-link entry and exit loop quadrants designed to prevent coil-set from being induced as the strip enters and exits the looping pit. Two sets of pushbutton adjustable heat-treated roller strip guides assure that the strip runs on the centerline.